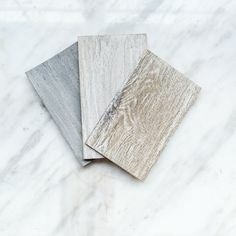 Daylight savings time started last week and the first day of Spring is around the corner which means it’s time to shake out the cobwebs of winter and make our homes sparkle. Lately, I’ve been seeing many laundry rooms and mudrooms (my home has neither right now) that make me think that having a room like these in my home might make the chore of Spring Cleaning not seem so bad. This laundry room painted has custom cabinets painted in a perfect coastal hue, Benjamin Moore Wythe Blue, and has a place for everything, keeping it all neat and tidy. You can find more images of this room and a ton of home organizing inspiration on The Sunny Sideup Blog, where Erin, who lives in sunny San Diego shares great home decor ideas an shares her home renovation. Staying with my favorite color scheme, here’s another laundry room in a coastal hue found on My Design Chic. I love the vintage charm this space has. And the bright piece of art in this room, adds a bit of charm to doing chores. 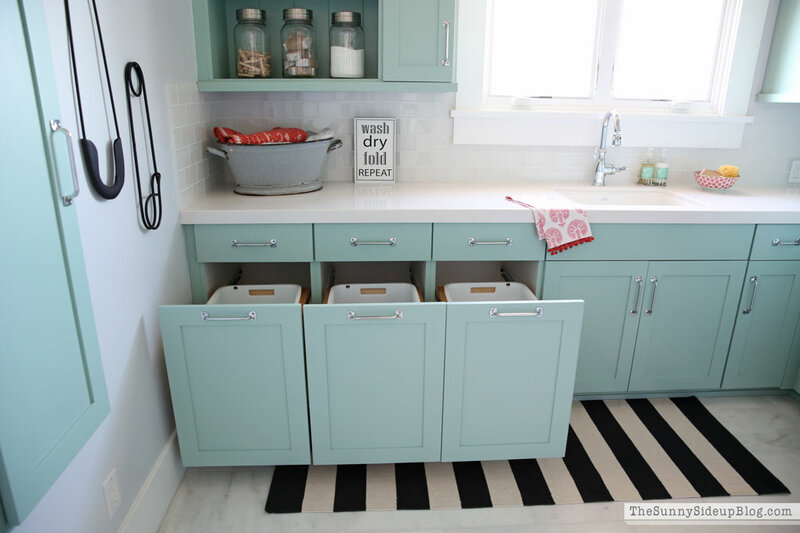 This laundry room found on Bungalow Blue Interiors is very similar to the one before it with the vintage style porcelain farmhouse sink, but the color is a little more subdued. 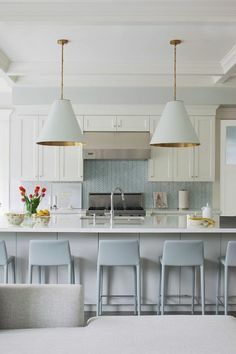 I’ve noticed how nice it is to have natural light in these spaces, and how the addition of an interesting light fixture like the brass sing arm sconce adds a lot of character. Speaking of interesting light fixtures, how about the pendants in this laundry/ mudroom? 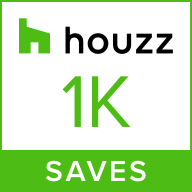 This space was designed by Artisan Studio and is from a remodel they did. You can see more images of the entire house on their website. They do amazing work and this laundry room is no exception. It seems they have thought of every detail. I know when we get to add a laundry/ mudroom to our home (and get the washer and dryer out of the basement) I will be looking back at this one for inspiration. There is something almost glamorous about this laundry room which again appears to also be a mudroom. Did I just say a laundry room looks glamorous? Well, I think this space by Jean Stoffer Design with it’s soft grey tones, mosaic chandelier, and silver orb pendant does have a bit of a glamorous vibe and would make tidying up for Spring not seem so tedious. 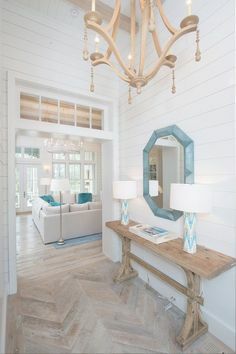 Although these spaces show styles, from cottage to traditional, I love that any of them would work in a home here in the Hamptons picking up on coastal tones and textures. 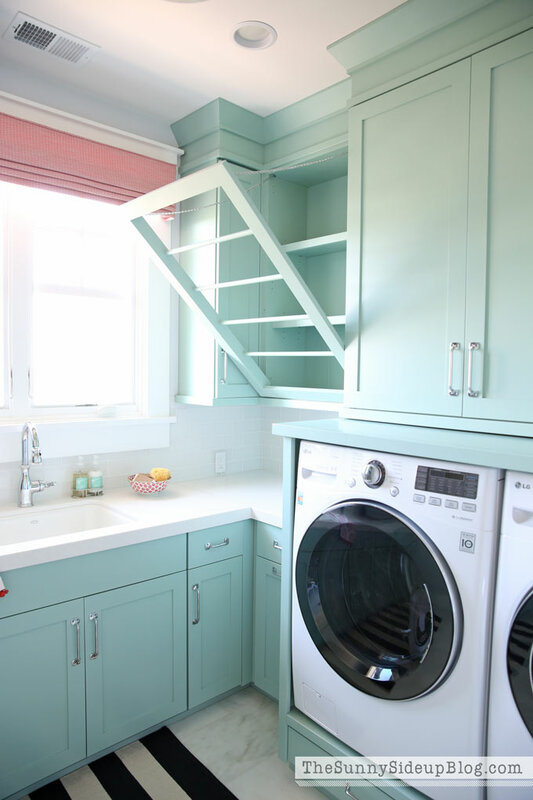 I’m not sure if these spaces make you want to jump off the sofa and start tidying up, but hopefully they inspired you to think about the typically not so favorite laundry room in new way and perhaps the perfect place in the house to kick start your Spring Cleaning. What’s your laundry room look like? Do you have one? If you do, does it do double duty as a mudroom? Let me know. 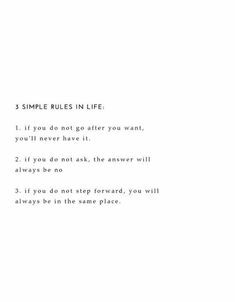 I’d love to hear from you.